About 10% of the Nigerian population is engaged in poultry production, mostly on subsistence and small- or medium-sized farms. The poultry industry is the most dynamic and fastest growing segment in the animal husbandry subsector in the country. As part of its work of testing, delivering and continuously improving tropically-adapted chickens for productivity growth in sub-Saharan Africa, the International Livestock Research Institute (ILRI)-led African Chicken Genetic Gains (ACGG) project conducted a cross-sectional baseline survey of a smallholder chicken production system in the country. Only 26.4% of the sample households were female-headed. The average number of years of schooling, family size and age of the household head were 7.8, 6.5 and 54.45 respectively. The mean adult chicken-flock size per household was 28 chickens. The flock structure and composition were dominated by chicks followed by hens. Almost all households (88%) in the study area had experience of providing supplementary feeding to their chickens at any time of the year. The most important traits in choosing good cockerels include good physical appearance, better meat taste, large body size and less illness. 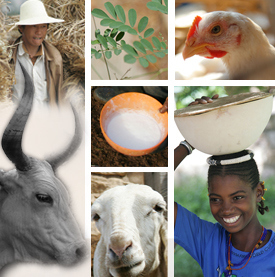 Farmers preferred local breeds irrespective of whether they kept the breeds or not. Adult women spent 94.26 minutes per week on chicken activities. The survey results were used in the design and implementation of the longitudinal (on-farm) ACGG study in the country. Findings from the study will also be used to identify the constraints and opportunities of chicken production for ACGG future research and development interventions in the country. Tags: ACGG, Survey. Bookmark the permalink.